Yesterday, we got hit with a classic Nor'easter. It snowed and blew all day long. We probably got a whopping 14 inches. On top of the 6 we already had. And now they are talking more snow Friday and another big storm Monday! At least we can sled and snowshoe! I much prefer a winter with a lot of snow. It makes the cold that much easier to bare. With all this snow and cold weather, it makes me want to bake. Who am I kidding- I love to bake no matter the weather or season! 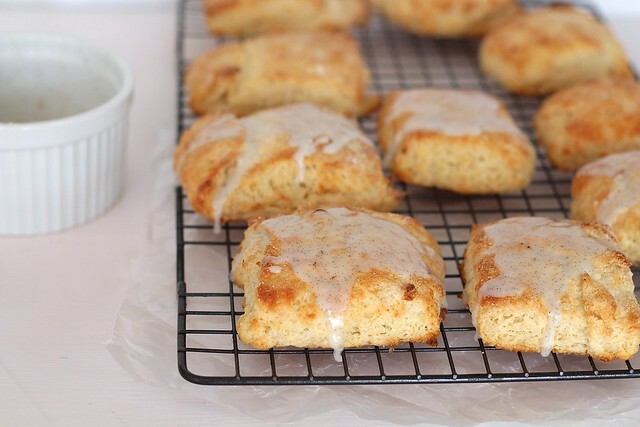 These scones have been on my to-do list for a while. Vanilla anything gets me excited. I have all these vanilla beans sitting in my pantry just waiting to be used. Especially since my ice cream making has slowed down. And, these scones are another perfect excuse to use some of that wonderful vanilla sugar I told you about. Sitting down with my cup of coffee, a warm scone, and snuggling up with a quilt to watch the snow, was the perfect way to start my morning. 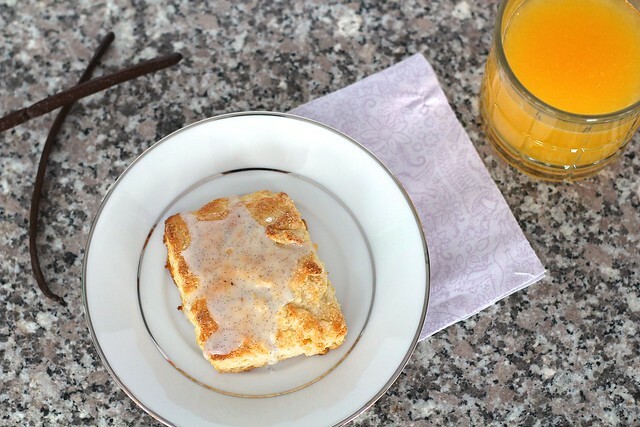 These scones are moist, a little flaky, and full of flavor. The vanilla is heart warming. And they remind me of summer. The perfect way to start any day. Preheat the oven to 400ºF. Line baking sheet with parchment paper or a silicone baking mat. Set aside. In a medium bowl, whisk together the flour, vanilla sugar, baking powder and salt. Toss in the butter pieces to combine. Using a pastry blender or two knives, cut the butter into the dry ingredients until the largest butter pieces are the size of peas and the mixture resembles coarse meal. Add the milk, vanilla and yogurt to the bowl. Mix together lightly with a spatula or fork until a sticky dough comes together. Very gently, knead lightly with your hands to incorporate the remaining loose flour. Don't over knead, or your scones will be dense. Turn the dough out onto a lightly floured surface. Pat the dough out to approximately an 8-inch square. Fold into thirds like a business letter. Pat the dough out into a 5x10-inch rectangle. With a lightly floured large knife or a bench scraper, slice the rectangle in half lengthwise. Then cut each half into 5 equal rectangles to make 10 scones total. Transfer the scones to the prepared baking sheet. Bake, rotating halfway through the baking time, until golden on top and just set, about 12-14 minutes total. Transfer to a wire rack to cool slightly. 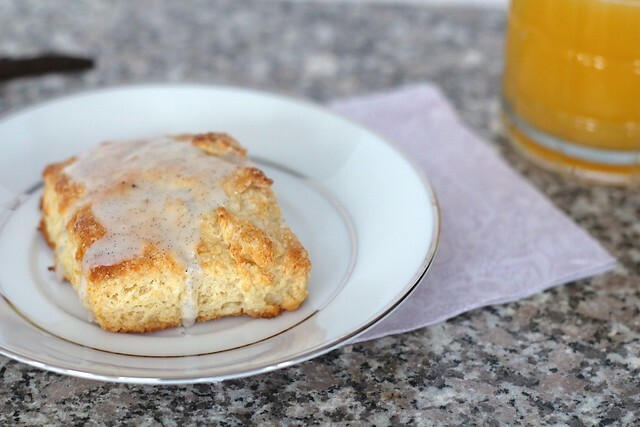 While the scones are still warm, make the glaze. Combine the confectioners’ sugar and the seeds scraped from the vanilla bean in a small bowl. Whisk in the milk a teaspoon at a time until you have a glaze that is slightly thick but pourable. Drizzle the glaze over the warm scones. Let set a few minutes before serving. *To make vanilla sugar, split a vanilla bean and scrape the seeds into 1 cup of sugar. Rub the vanilla seeds into the sugar with your fingertips until well combined and fragrant. Bury the vanilla bean pod in the sugar. Cover and let stand for at least 2 days to allow the flavors to meld.